The winner of the cat giveaway is Jo from Craft Yourself. 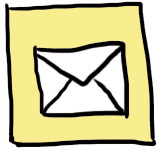 Please email me your address and I'll post the cat off to you asap. I had a nice long weekend in Rotorua catching up with family and doing some crafting with my Mum. We tried out a new-to-us super-quick "loop pieced" method for making a patchwork quilt. My youngest brother and his girlfriend are expecting a baby in October so Mum and I were trying out the method in advance so she can make the baby a playmat. It is really simple and quick and could be adapted easily for other shapes or sizes. You can find the instructions here. Today I was at home with a head-cold but managed to finish off a baby gift for Alex's step-brother and his partner. I made their little girl a couple of pairs of baby shoes and some matching bibs. I redrafted the Bend-the-Rules Sewing bib pattern so that it fastens to one side (a request from another friend I made some bibs for) and I'm pleased with how it turned out. Oh exciting, what a lovely surprise! Thanks Louise. Love the bibs and shoes you've made, and that quilt looks lovely too. Yes, bibs that fasten on the side are much easier! nice baby gift. sounds like we were up to similar things, I made my first bibs and enjoyed the process so much! 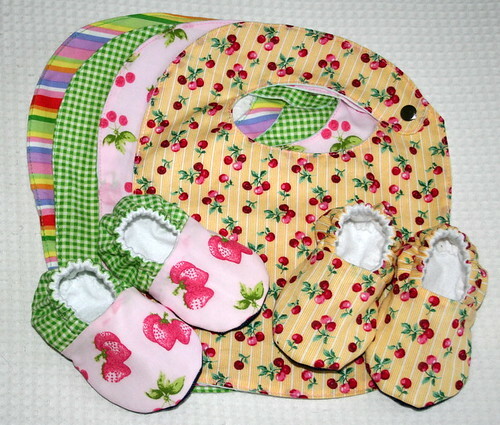 The bibs and shoes look great Louise - I especially love the cherries fabric. BTW a very, very belated happy 30th to you! Hope you had a great day and that 30 is living up to your expectations. (30 is a bit much for me so far - that'll teach me for moving with a baby!). Love the bibs and shoes!